The joys of spring…daylight saving and the opportunity to go for an evening fish (especially if it ever stops raining). And the trout are starting to feed with more vigour as nature's catering kicks in – insects both flying and aquatic are starting to hatch, while whitebait are starting to head up river. Adding spice and intrigue to the re-opening of three Rotorua lakes (Tarawera, Rotoiti and Okataina), somewhere is a healthy trout with a green tag worth a tasty $10,000 – which would be a great catch by anyone's standards. Read further on for details. In North Island regions like Taranaki and Hawke's Bay, Fish & Game staff are tipping local trout streams to be in good condition for the new fishing season after receiving some solid freshes over winter. In the South Island, the lower sections of North Canterbury rivers which were closed over winter, will reopen. With a mild winter in the south, trout should be in great condition, so our advice is to get out there early. If you are angling anywhere along the east coast of the South Island and catch a tagged trout, please let North Canterbury Fish & Game know where and when you caught it. Eighteen hundred tagged brown trout were released into the lower Rakaia as part of a project to learn more about the fishery. 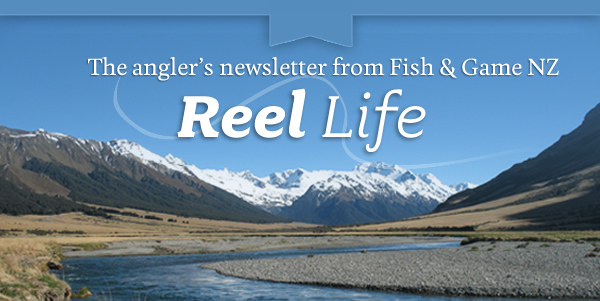 The Central South Island region has opened up more fisheries to spin and bait fishing to give anglers more options, so be sure to check the rules & regs as new areas are now open to you. P.S. - Thanks Nicole for this month's cover pic – new to trout fishing, she sent us this photo of her fine catch at Lake Rerewhakaaiku. Vote for environmentally friendly politicians! Remember to take a hard look at your local body voting papers – and choose candidates who care about the environment and water quality. At the risk of repeating ourselves, it's a great opportunity for those concerned about our environment and outdoor recreation enthusiasts to elect councillors who'll push for positive action on issues like water quality and recreational access. At the same time, we can help give the boot to environmentally unsympathetic councillors. Make your vote count – the elections for regional and district councils are on October 8. Fish for Gold is back! We hope you've entered the fun of trying to catch a fish worth $10,000 as the new trout fishing season gets underway on 1 October. Entries closed as of 30 September. Get fishing – the promotion runs until October 9. Fish & Game released 30 rainbow trout with specially numbered green tags - ten each into three lakes, Tarawera, Rotoiti and Okataina, in time for the opening. One green tag fish will win the grand prize but every tag wins a voucher prize. Check our website for updates on whether green tag have been caught. More information can be found here. Twelve hundred brown trout have been released into the lower reaches of the Rakaia River after the North Canterbury Fish and Game launched a research project in the critically damaged fishery. The fish were double-tagged to enable anglers to help out Fish & Game by recording where they caught these migratory fish. Another 600 fish will be released on the north side of the Rakaia. View our YouTube video here. Fish & Game New Zealand and the Environmental Defence Society are going to the Environment Court to challenge the way Horizons Regional Council in the central North Island is implementing its One Plan. The One Plan is designed to manage natural resources throughout the Horizons' region of Whanganui and Manawatu, with particular emphasis on tackling pollution, improving water quality and preserving environmental diversity. EDS and Fish & Game have become increasingly frustrated with how Horizons has implemented it. The two environmental groups say they are now filing proceedings in the Environment Court challenging Horizons Regional Council. Read more here. Winter floods are abating and the sun-warmed pools and riffles are alive with life as insects hatch and rise and mate. In the high country, green stoneflies break through their chitinous shells and scramble for the boulders where their wings fill with blood and expand to give them flight. Mayflies drift in pretty convoys, before taking to the skies on their last fateful journeys and dry-winged caddis float the currents before heading for light and the chance of mating. In the lower reaches, the river brings silt to fill the gaps between stones. Under boulders, in muddy hollows the nymphs of Dobson flies squirm and turn to free themselves from watery dens. They are the wolves of the insect world armed with stout pincers to grab and crush their prey. On shore they are clumsy in flight, crash landing in streamside foliage. As rivers near the sea their flow slows and midges find a home in backwaters and ponds. They cloud the air in the evenings, bringing welcome swallows to feast.